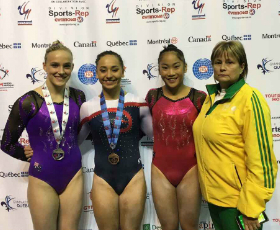 Congratulations to Waverley’s Emily Whitehead, Jade Vella-Wright and Talia Folino who competed at the renowned International Gymnix event, held from March 9th-12th in Montreal, Canada. 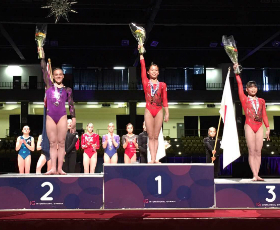 Competing for Australia in the Senior Cup division, Emily and Jade performed strongly to place 10th and 13th All Around. The Australian team narrowly missed out on a podium finish, finishing 4th in the team event. Click here to view a fabulous photo gallery from the Senior Cup competition including some beautiful photos of of Emily and Jade. Talia competed for Waverley in the Challenge Gymnix division, and claimed the All Around title with a score of 52.567!! Click here to watch Talia’s post-competition interview. 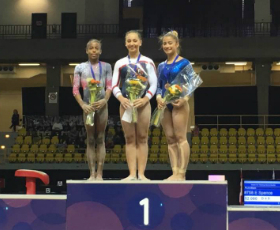 We are very proud of the performances of all three girls throughout the competition, representing Waverley and Australia on the world stage!